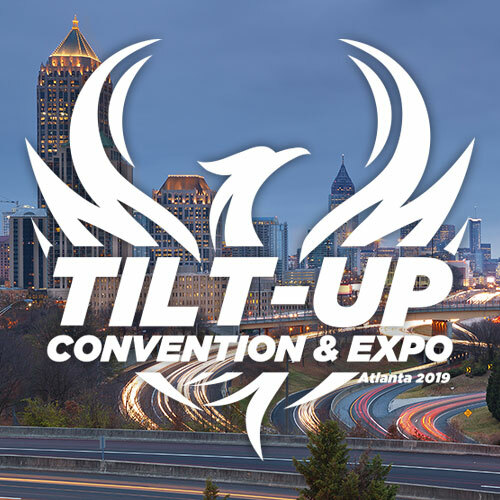 The Tilt-Up Concrete Association (TCA) announces the availability of the completely revised TCA Guideline for Temporary Wind Bracing of Tilt-Up Concrete Panels During Construction version 18.1. This release supersedes all previous versions. Version 18.1 of this guideline, updated by Joseph J. Steinbicker, P.E., S.E., FTCA, incorporates the methodology of ASCE/SEI 7-16, Minimum Design Loads and Associated Criteria for Buildings and Other Structures, to calculate the limit state wind loads to be used to design the temporary erection braces and their connections. This guideline is intended to be used in conjunction with ASCE/SEI 7-16 for access to the figures and tables referenced throughout the guideline. A significant departure from previous versions of this guideline is the adoption of strength design principles so that the design of the braces and their connections is consistent with other material design principles and standards. As an alternative to using strength design principles to design the braces and their connections, the use of Allowable Stress Design (ASD) principles is equally acceptable per version 18.1 of the guideline. Another significant change in this version is the inclusion of the effect openings have on the effective wind loads applied to the braces. 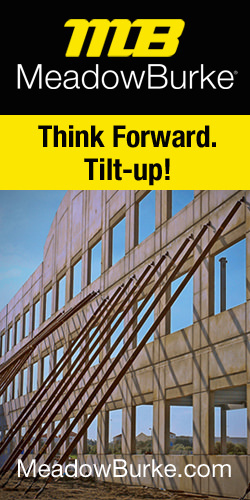 Panels with large openings can see a significant reduction in the applied brace forces. This guideline continues the use of a Risk Category I structure, the same as the 2012 edition. However, to reflect the overall reduction to the basic wind speeds for Risk Category I structures in ASCE/SEI 7-16, the basic design wind speed adopted for this guideline is 100 mph. Applying the 0.8 adjustment factor for projects whose duration is six weeks to one year, results in a strength level design wind speed of 80 mph. Therefore, for this guideline, the Basic Wind Speed adopted for calculating the limit state wind loads is 80 mph, Exposure C, for a Risk Category I structure. 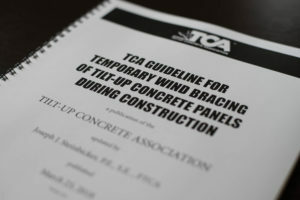 The TCA Guideline for Temporary Wind Bracing of Tilt-Up Concrete Panels During Construction version 18.1 is available from the TCA in print and digital formats at www.tilt-up.org/resources.